Kyoto is a representative city of the Japanese culture, history and tradition. This city has a long history which can be found in the particular style of its architecture, with famous temples and shrines. In 794 A.C. Emperor Kammu decided to transfer the capital to a city he named Kyoto. Already an important city, by the late 12th century, Kyoto had become the centre of commerce and industry in Japan. Kyoto is currently the sixth largest city in Japan, with a population of 1.5 million inhabitants, and one of Japan’s most visited tourist destinations. Another representative icon of the Japanese culture are the well-known Geisha’s. A Maiko, however, is a young apprentice who learns the arts and customs of the Geishas. Maikos are said to be the epitome of beauty in the Japanese culture due both to their personal beauty and their amazing outfits. This unique Pelikan “Maiko in Kyoto” Maki-e Fountain Pen combines both elements of Japanese culture in a fascinating writing instrument for you to enjoy wherever you are! The Pelikan “Maiko in Kyoto” Maki-e Fountain Pen, is part of Pelikan’s Maki-e Limited Edition Collection. It is made on a Souverän M1000 model, with its famous piston-filling system and pelican-beak gold plated clip. 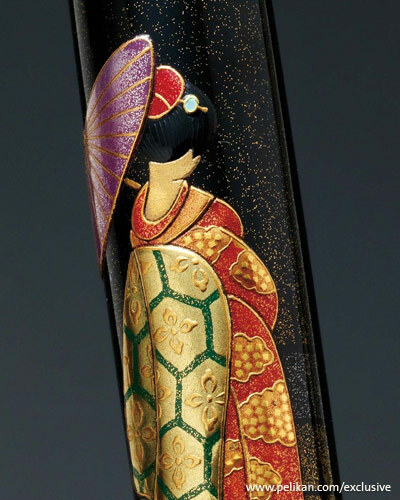 This particular design is finished in Togidashi Maki-e lacquering, a magnificent Japanese technique which carries out the design using multiple layers of Urushi lacquer and finishing with gold and silver dust. This particular design presents a young Maiko wearing a “furisode” , a long-sleeved kimono for unmarried women, surrounded by falling cherry-blossom petals and Kyoto’s famous five-story pagoda. The whole design is hand painted by Japanese artisans! Pelikan launched this magnificent fountain pen in 2010 as a limited edition of only 88 pieces worldwide. The limited edition number and the artist’s signature can be found on the the cap in Maki-e lacquer. 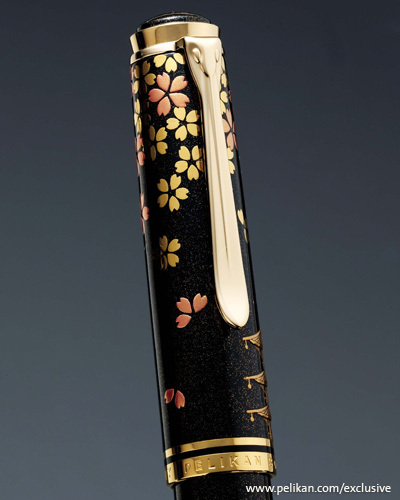 This fountain pen was made in the historical Japanese region Kaga, famous for traditional Japanese arts. It includes an two-colour 18K solid gold nib and the trims are gold plated for en even more elegant fountain pen. For more exclusiveness this rare writing instrument comes in a fantastic traditional Japanese gift box made of Paulownian wood! This wonderful item is available at Iguana Sell for those interested in completing the collection, or bringing the wonders of Japanese culture to their everyday life. If you are interested in any other Pelikan Maki-e Collection Fountain Pen, feel free to visit our website for more information.